With a desire to improve everyday objects, Peugeot reinvents the iconic lever corkscrew combining ingenuity and aesthetics. The traditional way of opening of bottle. 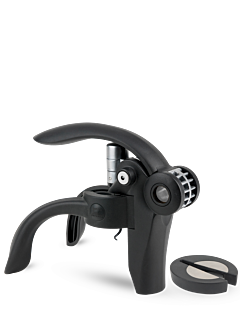 Elegant, durable, easy to handle and use, suitable for all bottle shapes and easily transportable, the Peugeot lever corkscrew is famous for its ingenuity and the high quality of its mechanism. With a harmony derived from its sleek balanced style, it is structured around two handles that reinforce a half-tube that holds all bottles firmly for effortless uncorking. The two axes of rotation, gently screw into the cork while turning and prevent cork pieces from going into the bottle. Then, simply lift the lever upward to smoothly release the cork. The high-precision mechanism that engages when opening the bottle is made entirely in steel, resulting from Peugeot's historic metal expertise. Together with the foil cutter, the Peugeot lever corkscrew comes in three stylish contemporary finishes: solid gun metal effect, black grained ABS and aluminium look. A very beautiful object, presented in a gift box, which will be used and displayed, offering both functionality and style.